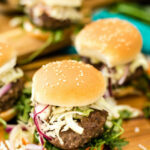 Add a whole world of flavor to your next burger by creating your own grind with short rib and chuck and then stacking on a fresh lemongrass slaw and spicy gochujang mayo! Grind the chuck and short rib with your meat grinder thoroughly. Combine the Soy Ginger Cuisinart Seasoning Mix, Worcestershire sauce, minced shallot, and salt and pepper. Using your hands, mix to combine. Form into even patties, dimpling in the center. Season both sides with additional salt, if desired. Preheat the griddle to high heat. Add the patties and cover, cooking for 4 to 6 minutes until a nice crust forms. Using the spatula, flip and cover, allowing the burgers to cook through. Carefully remove from heat and allow to rest while building your burger. Whisk the lemongrass, brown sugar and apple cider vinegar together in a bowl and pour over the cabbage mix. Allow to sit for a few minutes before tasting. Toss, taste, and add salt if needed. Whisk the mayo and gochujang sauce together in a small bowl. Arrange the burger buns with the tops removed. Add a short rib grilled patty and a pile of lemongrass fennel slaw. Top with the remaining bun topper and serve hot. Freeze your meat grinder attachments for at least 30 minutes before grinding. Always work with cold meat to make sure the fat doesn't get too warm while grinding. This causes it to stick and clump inside of the grinder and doesn't produce a good burger texture.